The new protest law consists of 25 articles, which outline in detail the conditions that must be met before a protest, political meeting or march is held. It also details the penalties for violations of the law. Article 1: Citizens have the right to hold and join public meetings, marches and peaceful protests in accordance with the provisions and regulations of the protest law. Article 2: A public meeting is any gathering in a public location or place wherein persons may enter or be allowed entry without a personal invitation and whose number is no less than 10, for the aim of discussing or exchanging opinions about a subject of a public nature. 1. That their aim is choosing a candidate or candidates for parliament or hearing their electoral programmes. 2. That it only includes the voters and the candidates or their representatives. 3. That the meeting is held during the period allotted for election campaigning. Article 3: A march is a procession of at least ten persons in a place, road or square, to peacefully express non-political opinions and aims. Article 4: A protest is a gathering of at least ten persons in a public place or moving in roads and squares, with the aim of peacefully expressing their political opinions, demands or objections. Article 5: Prohibition of any political gathering in houses of worship, their vicinities or buildings associated with them, in addition to barring houses of worship from serving as meeting points for marches. Article 6: Participants in protests, meetings or marches are prohibited from carrying any weapons, explosives, fireworks or other items that may put individuals, buildings or possessions in danger. Wearing masks to hide the face during such actions is prohibited. Article 7: Violations of general security, public order, or production are prohibited, as well as calling for disrupting public interests. It also forbids actions which could impact on public services, transportation or the flow of traffic, as well as assaults on security forces or exposure of danger to individuals, public or private possessions. 1. The place of the public meeting or route of the march or protest. 2. The start and end time of the public meeting, march or protest. 3. The subject of the public meeting or march or protest, its aim and the demands and slogans adopted by the participants in them. 4. The names of the individuals or organising organisation of the public meeting or march or protest, their description, place of residence and communication information. Article 9: The interior minister shall issue a decree forming a permanent committee in each governorate presided over by its security director, its mission being to establish procedures and measures to secure public meetings, marches and protests that have given notice, and the modes of operation to deal with violent protests, in accordance with the provisions of this law. Article 10: The interior minister or the security director may authorise a reasoned decision to prohibit or postpone or change the location or route of a public meeting or march or protest before its stated start time if serious information or evidence of threats to security or peace are obtained by them, notifying the organisers of the decision a minimum period of 24 hours in advance. Without prejudice to the purview of the Administrative Court, the organisers may appeal the decision to ban or postpone decision. Article 11: Security forces in official uniform should disperse protests, meetings or marches in the event of a crime at the order of the field commander. The field police commander can ask a judge to determine the non-peaceful state of a meeting or protest. A decision should be issued immediately. Article 12: Security forces must utilise methods of gradual dispersal for protests in breach of the law. Authorities must first ask participants to voluntarily leave through audible verbal warnings, which should be repeated several times whilst indicating and providing secure paths out of the venue of assembly. If participants refuse to leave, security forces have the right to use water cannons, batons, and teargas to disperse protesters. Article 13: In the case of security forces failing to disperse gatherings through afore mentioned measurements, or if violent assaults erupt against security forces, escalatory measures may be taken. In this case, security forces should first fire warning shots, then escalate by using rubber bullets and finally metal pellets. If participants use weapons, security forces should respond using means proportional to the danger imposed. Article 14: The Minister of Interior, in coordination with the concerned governor, should designate a safe space for protesters in front of vital institutions. Such institutions include government, military, and security buildings, as well as courts, prosecution centres and museums. Article 15: Protests in specific spacious venues will be allowed to take place without prior notification. Such spaces will be defined by the governor. Article 16: The following states the penalties in the case that earlier articles are violated. Article 17: Whoever possesses weapons or explosives while participating in a protest, meeting or march could face imprisonment of seven years and pay a fine of between LE100,000 and LE300,000. Article 18: A participant who has received or given money and/or benefits to protests, meetings or marches is to face prison and a fine of between LE100,000 and LE200,000. The same penalty will be imposed on whoever is responsible for inciting such a crime. Article 19: A participant who violates Article 7 in the protest law could face 2 to 5 years of imprisonment, in addition to the possibility of paying a fine of between LE50,000 and LE100,000. Article 20: Violating Articles 5 and 14 or wearing masks while committing a crime during a protest could lead to a maximum sentence of a year in prison and a fine of between LE30,000 and LE50,000. Article 21: Holding a protest, meeting or march without giving prior notification as dictated by Article 8 could result in a fine of between LE10,000 and LE30,000. Article 22: For any of the listed crimes, the courts can order the confiscation of tools or money used during protests or marches. However, this article excludes those who act with good intentions. Article 23: Law 14, issued in 1923, is to be annulled, in addition to the cancellation of any laws that contradict the new protest law. Article 24: The cabinet is to issue decisions regarding the implementation of the provisions of the protest law. Article 25: This law is to be published in the official gazette, and will be in effect the day after publication. This is not an official translation. when I wrote the Egypt Constitution in March 2013, I wrote the above 'rules of engagement' for a new police unit (("President (has his own) Law Enforcement (paramilitary) Regiment")), 'POLER', not for the Mubarak-era security service. In regard to protests, POLER is to protect 'peace assembly', at their request. In addition, I would define a 'protest' versus other gatherings, as chanting for more than 30 seconds. As for 'slipping in' poliical meetings with the same subject as protests or marches, making the entire 'article' reek of a Stasi police state, only a dishonest person thinks that's clever. The translation is very inaccurate! That's a law!!!! Translation must be very accurate! This inaccurate translation may lead to troubles and confusions!!! Please use a jurist for this!!!!!!! If you are living in a jungle around the wild devils, you cannot compare it with a urban and civilized and develop society. Yes in UK, protest organizers must notified the Police about the all the details of the protest 6 or 12 day or whatsoever prior to the protest date but can you tell, Does the police are Army allowed to use fire arms or kill the thousands of their own citizens..? Does the UK army is allowed to over throw their Prime minister or their Queen..? Can the UK army suspend the British constitution..? Can the UK Army kidnap their elected PM…? Can the UK Army can run a parallel business empire..? Is their Defense Minster is nominated by the Army…? Can any of the British Judge can think to become president through a Army Coup...? The Fact is, Old regime is now openly showing their decade long repressive policies and their supporters shamelessly justifying it. Jan 2011 revolution is a past history now. 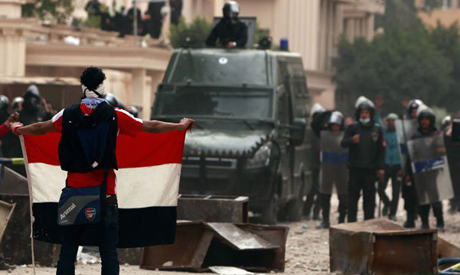 All civilized countries has protest law to avoid chaos which unfortunately we can see on streets of Egypt. As example, part of UK protest law: By law you must tell the police in writing 6 days before a public march if you’re the organizer. Tell the police the: date and time of the march, route, the names and addresses of the organizers, The police have the power to: limit or change the route of your march, set any other condition of your march, If you arrange a march at short notice, you must still tell the police as soon as you can. The police can also: change the location, limit how long a rally lasts, limit the amount of people who attend, stop a sit-down protest if it blocks road traffic or public walkways. I don't see above law is suppressing people from protesting in UK. Its literally banning the protest because if people can not protest in front of government officials than there is no point in protest, they can not just protest in jungle. We have the same laws in the UK and protests are carried out, but normally in an organised and peaceful manner, the police clear the route for the protesters and provide barriers between rival protesters. The only thing that I see as being different in this case is the article about uncovering faces/not wearing masks. The Muslim brotherhood vandalizes propery, and murders policeman. Sorry you wont be allowed to commit crimes as you wish, may be you should go out anf find a job instead.